Anger can destroy you. It can make a bad situation worse. But last fall, Agustín Cordes and a group of other people took their anger, their hurt and their frustration and did something with it: they teamed up to make a video game. The video game they made is called Serena. It just came out, and it's free on PC. Ostensibly, Serena is an adventure game about a man in a log cabin who is struggling to remember his missing wife. The real story is that Serena is the game that Cordes and a far-flung group of fellow adventure game creators and fans created together—in just a handful of weeks—in order to deal with upheaval in the adventure game community. That a scene of people had been hoping for a revival of a once-glorious gaming genre thanks to a slew of successful adventure game Kickstarters, including the one that made this whole Kickstarter thing a big deal. They began to fear that in-fighting might mar that comeback. The drama centered on the entrepreneur Paul Trowe, a long-time adventure game fan himself whose Replay Games helped bring the Leisure Suit Larry back after a successful half-million-dollar 2012 Kickstarter and who has supported other adventure game comebacks. The damage had been done. Nelson, through her advocacy for numerous adventure game Kickstarters, had come to be known as the "Hero of the Adventure Game Revival Movement." For Cordes and others, Trowe's words and the debate around them were painful. Cordes: "My reasoning was 'OK, let's do something together to counterbalance such awfulness.'" Cordes says he was a bystander to all of this. It upset him. "I saw many people hurt by Trowe and [sensed] a general feeling of discomfort in the adventure game community," he told me over e-mail. "The genre was enjoying a much-needed revival, with successful Kickstarters, lots of excitement, positive feelings, and yet Trowe was somehow ruining all that with his vitriol and bullying." Cordes said it wasn't personal. "I never had dealings with Trowe, I haven't been wronged by him in any way," he said. "I just really felt that something had to be done. My reasoning was 'OK, let's do something together to counterbalance such awfulness.'" The "something" that Cordes decided to do was to make Serena, the game. And, yes, the game is named after Serena Nelson. Serena (the game) doesn't feature Serena Nelson or Paul Trowe or go into any of what happened last year. Players won't be aware of any of last year's drama. They'll simply get to play what is intended to be a positive reaction to a negative situation. That response is an adventure game that lasts about an hour and helps Cordes himself get back into the adventure-game making. Asylum uses a new game engine called Dagon that Cordes wanted to release to everyone, open source. Cordes also wanted to eventually release a tutorial for the engine in the form of a short game. He figured he'd get to that eventually, after finishing Asylum. He had a rough idea about what it would be: an Edgar-Allen-Poe-style short story of a game. He had a name for it: Helena. "I needed a name that evoked mystery and haunting memories," he recalled. He had these ideas, but he was going to wait. Asylum, first. Then came last fall's drama. And then came an idea. Cordes decided that the best thing to do to cheer the community up would be to rally people in the adventure gaming scene to do something positive. He invited them to work with him on Helena, to put that game on the front burner. He decided to change the game's name. Helena became Serena. "Not only is 'Serena' a much better name," Cordes said, "But it also represents a lot: a nod to the real Serena, a wonderful friend and staunch supporter of adventure games, who in turn has brought many fans of the adventure genre together." Mandel: "Agustín's 'Serena' project was, to my mind, simply the greatest gesture any game designer could make towards a fan." On December 2, Cordes crafted a design document for the Serena game. He started reaching out to people who had stuck up for Serena Nelson. Cordes is based in Argentina, but he aimed to make this game a global effort. "I created a Dropbox folder, a private forum, and began inviting people to work on the game," he said. "At first we were four people, basically the writers, and all very close friends with Serena. Little by little, someone else was brought on board: someone who would do programming, another one who would contribute with hand-painted art, a musician, and so on." Some contributed their names as authors on the game's bookshelf. They could give their books any title, Cordes said, so long as they weren't attacks on Trowe or anyone else. Cordes managed to recruit more than 40 people to contribute to the project. That includes ex-volunteers from the Leisure Suit Larry remake project. It includes Scott Murphy, co-creator of the Space Quest series and New York-based independent game developer Josh Mandel, who, among other things, originally voiced King Graham in the King's Quest series. Mandel used to work with Trowe as part of Replay but left last year some time after the Larry revival came out. "It haunts me that a project that began with such good intentions could end up so ugly by the end, and create so much negativity," Mandel wrote to me in an e-mail. "Agustín's 'Serena' project was, to my mind, simply the greatest gesture any game designer could make towards a fan, and so I wanted to support those efforts in any way I possibly could." He referred to the Serena game as "the most enormous love-and-condolences note in adventure gaming history." Nelson: "In the end I feel that the positives far outshine the negativity surrounding what happened." Serena Nelson herself didn't know about the game until a few weeks ago. Cordes wanted it to be somewhat of a surprise. She's given him the okay to use her name and likeness in the game and, recently, she played it. "I couldn't be happier with how it all turned out," she told me. "I hope that everyone who plays the game leaves as satisfied as I have." Nelson says the incidents of last fall "really hit me hard. But it was the friendship and love that I got from friends and others in the community that helped me to pull through. I believe that there's always a silver lining in even the darkest of clouds, and in the end I feel that the positives far outshine the negativity surrounding what happened." So what exactly is Serena? It's a short adventure game. It takes about an hour to play. It's free. And it's got a surprise, so, mostly, mum's the word. Most obviously, it's a first-person point-and-click game about a man who is trying to figure out why he can't remember much about his wife. He's in the log cabin that he used to share with Serena, his wife. There are various accoutrements of their lives for him to check out, one mouse click at a time. Serena is essentially a one-room game, though its one room is designed to be clicked on a lot. Click on the bed or the hairbrush or the rug multiple times and you'll hear different things from the husband, whose 500-some lines are all voiced by Mandel. Play further along, have the story advance and click on those things and you'll hear even more about those objects. The narrator's thoughts have changed. Cordes hopes that feels like a breakthrough. "This is something that always bothered me in adventures, how feedback feels so 'static,'" Cordes said. "You click on one item, you get one response, and that's it. Click again and the response is repeated. This breaks immersion and hurts the storytelling, so what we did for Serena is create a huge deal of feedback and thoughts for the protagonist—every item has its own stream of thoughts, nearly a whole separate story about the relationship. As the game evolves, these stories also evolve and become more grim and sad. They're complemented by the more general thoughts ('unrequested feedback' as I like to call them) that do not depend on actions by players." Cordes promises a similar approach with the much grander Asylum, which he is back to focusing on. Cordes doesn't want people to get the wrong idea about Serena. The game may have come from a trauma to the adventure game community, but he insists it's not about that. He doesn't want people to see it as an attack on anyone but, rather, as a "happier conclusion." He understands that it might even seem a bit odd to make a creepy little game as a tribute to a community that already had some dark clouds over it. But he thinks it works. 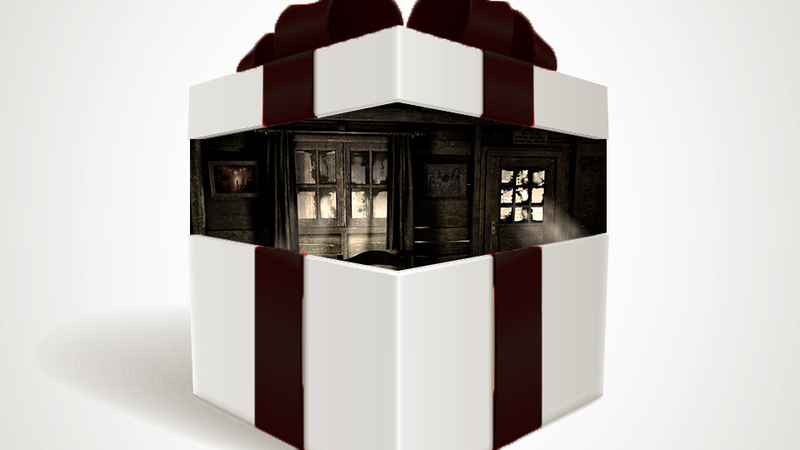 "I have a twisted sense of humor," he said, "So I love seeing this as a disturbing gift for fans of adventure games." Ultimately, Serena is unusual in that, even if it isn't an attack, it's a reaction. It's hard to think of many other games that are forged from the fires of events in one autumn that are already finished and playable the following winter. Cordes and his team have used their chosen medium as a way to respond to a personal situation, a path only possible thanks to the increased ease of disaggregated web-connected game development these days. What's more is that a game can be used not just to react, he's proven, but to respond. "I can't stress enough how powerful games can be," Cordes says, "especially as vehicles to tell interactive stories that challenge you like no other medium does. Ultimately, our statement with Serena is 'we stand united'—also, 'we really love adventure games and its community, and we can't wait to collaborate on another project again.'" Serena is available now, for zero dollars, on Steam for Windows, Mac and Linux. It also will be open sourced shortly after release. To contact the author of this post, write to stephentotilo@kotaku.com or find him on Twitter @stephentotilo. Photo via Shutterstock.